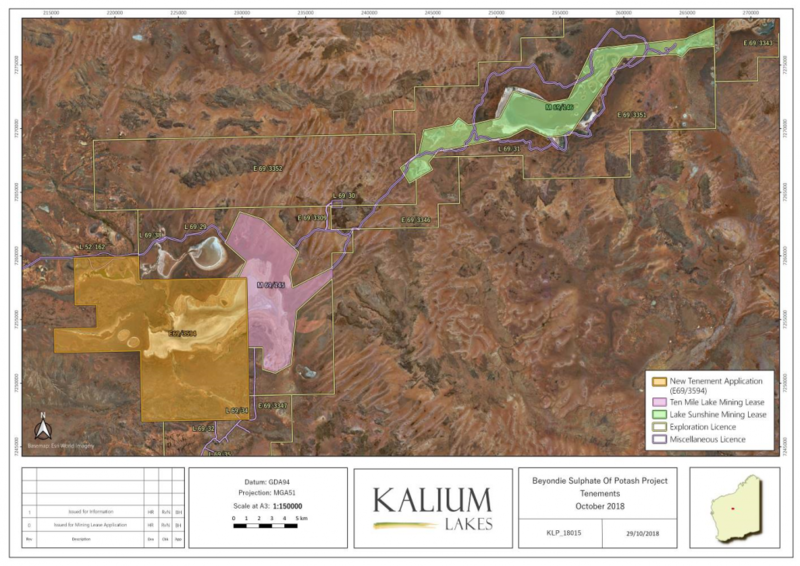 Kalium Lakes Limited is an Australian, publicly listed (ASX:KLL) exploration and development company, focused on developing the Beyondie Sulphate Of Potash Project in Western Australia with the aim of producing Sulphate of Potash (SOP), a high yield, premium fertiliser, for both domestic and international markets. 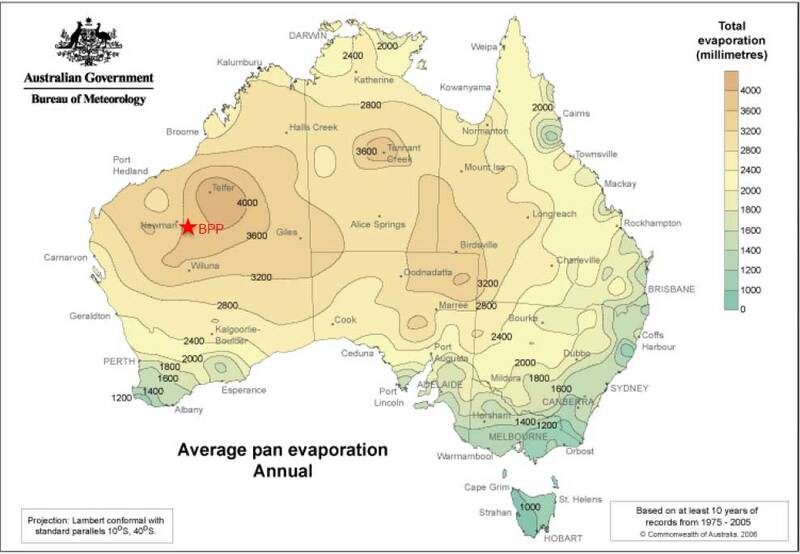 There is currently no SOP production in Australia. The Beyondie SOP Project comprises 15 granted exploration licences, two mining leases and several miscellaneous licence covering an area of approximately 2,400 square kilometres. This sub-surface brine deposit will supply an evaporation and processing operation located 160 kilometres south east of Newman. Approaching a Final Investment Decision, the Company has just completed a Bankable Feasibility Study for the Project (the first BFS for any Australian deposit) which confirmed the Project is technically and financially robust, with first production anticipated in 2020. The Project aims to commence production at 82ktpa of SOP, before ramping up to 164ktpa of SOP for domestic and international sale. An initial mine life of between 30-50 years is anticipated for a project designed to be a low cost, long life and high margin producer. Robust, Bankable Project: BFS confirms that Kalium Lakes’ 100% Owned, Beyondie Sulphate Of Potash Project (BSOPP), is technically and financially robust, with production anticipated in 2020. Increased Production Rates: The base case outcome of the BFS for the Beyondie SOP Project is a 164ktpa SOP operation. This is an increase of 10% on the Pre-Feasibility Study (PFS) based on (amongst other matters) an update to the Company’s increased Ore Reserve, detailed brine extraction modelling, pilot scale pond and processing outcomes. After taking into consideration operational, SOP market and financing risk management perspectives, the Company has confirmed a phased ramp-up development scenario, starting with a commercial demonstration scale 82ktpa SOP operation, before ramping up to a 164ktpa full scale SOP production facility. Extended Mine Life In Excess of 30 years: Based on production of 164ktpa SOP, the extended mine life represents an increase of 7 years on the PFS estimated mine life. The Economic Evaluation excludes any production post 30 years from the Base Case Mine Plan. CRU estimates that average CFR Australian prices in the first year of full production (FY2022) will be US$530/t with prices rising to US$961-997/t in 2040. CRU forecasts a 2.8%pa growth in SOP. 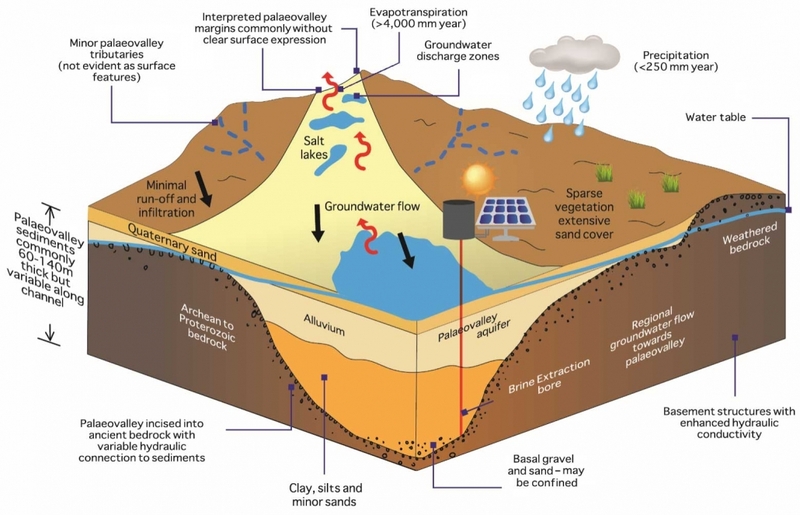 Kalium Lakes to produce a premium Standard, Granular and Soluble suite of products at >51%K2O and <0.5% Chloride. Each product will attract a different price and premium. Offtake Terms Sheet executed with German fertiliser producer and distributor K+S for 100% of Phase 1 production. The Offtake arrangement is subject to the execution of a formal binding offtake agreement and satisfaction of certain conditions precedent, including completion of due diligence by K+S. Estimated LOM Operating Cash Cost of A$231/t SOP FOB Fremantle Port. This will place the Beyondie SOP Project among the lowest cost global SOP production. Pre-production Capital Cost of A$159 million for the initial 82ktpa phase. A deferred capital cost of A$125 million is required to ramp up production to 164ktpa SOP. Pricing has been received from contractors and suppliers for more than 80% of Capex Costs. Option to install a gas pipeline at a capital cost of A$29 million which would result in an operating costs reduction of A$31-34 per tonne. Early works approvals are in place from the Environmental Protection Authority of Western Australia (EPA) and Department of Mines, Industry Regulation and Safety (DMIRS), with formal approval for the full-scale project anticipated to be in place during Q4 2018. Two Native Title Land Access Agreements have been executed allowing for the consent to the grant of mining leases, ancillary tenure and approvals required for the BSOPP. Two Mining Leases and 10 Miscellaneous Licences have been granted for the Beyondie SOP Project. The Company is proposing to fund the project capital expenditure by a combination of up to 60% debt and the residual equity. The Company has progressed the process for debt financing with initial due diligence completed and Expression of Interest (EOI) term sheets received. The Company estimates that approximately A$42 million of the project capital expenditure is expected to qualify under the German Export Credit Agency (ECA) scheme which has received a positive preliminary assessment decision by the German Government Inter-Ministerial Committee (IMC) and Euler Hermes Aktiengesellschaft (Hermes), the appointed export credit agency that administers the German ECA scheme for the German Government. Australian Government’s Northern Australia Infrastructure Facility (NAIF) has provided written confirmation that the NAIF Board has considered a Strategic Assessment Paper for the BSOPP and has consented to the NAIF Executive continuing its investigation. 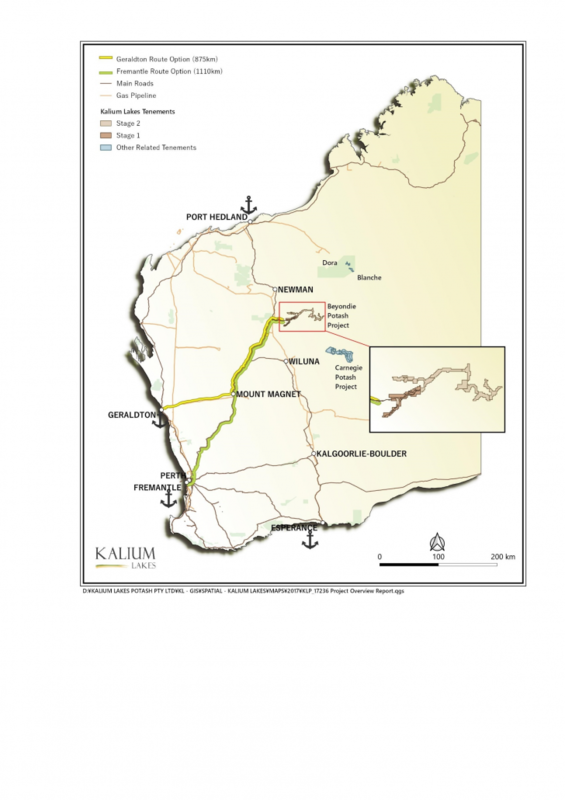 Kalium Lakes’ Board has now endorsed the commencement of early works and Front-End Engineering and Design (FEED) prior to a Final Investment Decision (FID).